Rediscover life with less pain. 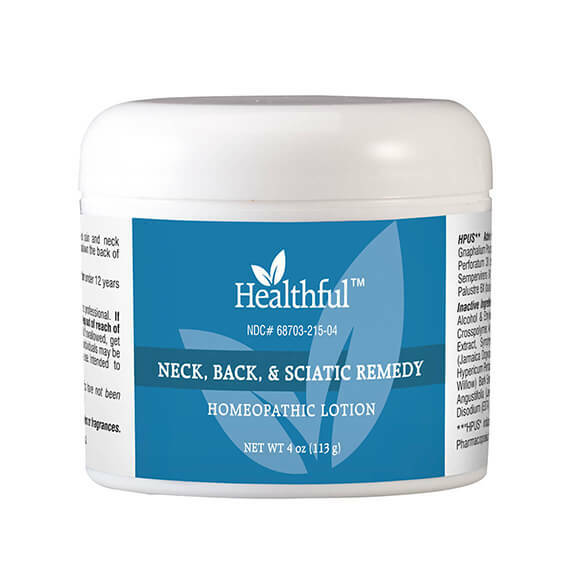 Healthful™ Neck, Back & Sciatic Remedy features a homeopathic blend of effective active ingredients and herbal remedies that helps temporarily relieve minor chronic or occasional discomfort in the neck, back, along the sciatic nerve, lower back or backside of the legs. Homeopathic formula won’t interfere with other medications. 4 oz. tub is a great value! 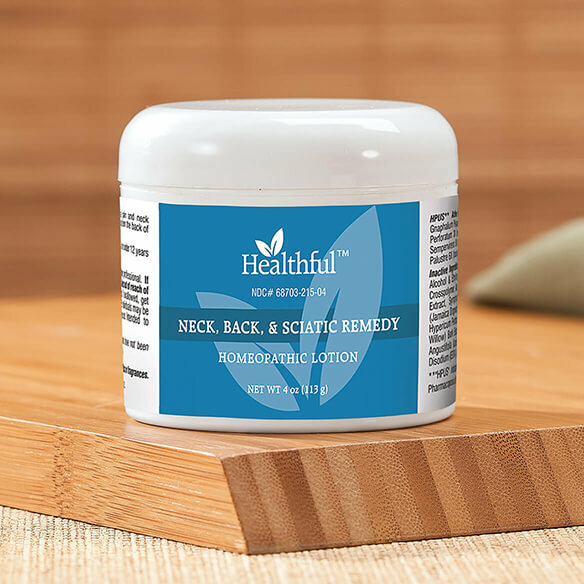 Water-based nack and back pain relief gel. Homeopathic remedy not tested on animals and contains no parabens, petroleum, or artificial colors or fragrances. Inactive Ingredients: Purified Water, Vitis Vinifera (Grape) Seed Oil, Whey Protein Concentrate (milk), Lecithin (soy), Phenoxyethanol & Caprylyl Glycol & Sorbic Acid, Acrylates/C10-30 Alkyl Acrylate Crosspolymer, Aloe Barabadensis Leaf Juice, Achillea Millefolium (Yarrow) Flower Extract, Arnica Montana (Arnica) Flower Extract, Hypericum Perforatum (St John's Wort) Aerial Parts Extract, Phytolacca Americana (Poke) Root Extract, Piscidia Piscipula (Jamaica Dogwood) Bark Extract, Salix Alba (White Willow) Bark Extract, Symphytum Officinale (Comfrey) Leaf Extract, Polysorbate 20, Lavandula Angustifolia (Lavender) Buds Extract, Sodium Hydroxide, Ascorbic Acid, Tocopherols (soy), Edetate Disodium, Natural Plant Extract and Potassium Sorbate.